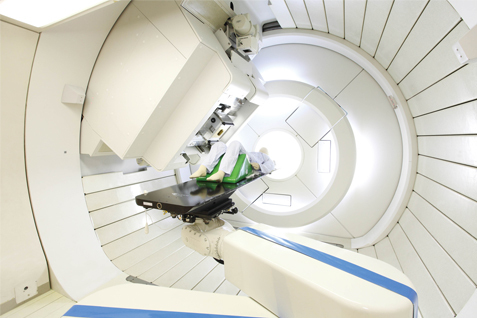 Sumitomo Proton Therapy System clears FDA 510(k) | News - Fiscal 2013 | Sumitomo Heavy Industries, Ltd.
Sumitomo Heavy Industries, Ltd., (President: Shunsuke Betsukawa)　announced today that it had received US FDA 510(k) clearance of its Proton Therapy System. It is the first 510(k) cleared medical device for Sumitomo. Proton therapy is a form of radiation therapy, which employs proton beams to kill cancer cells with better dose distribution in comparison with conventional x-rays. Currently 12 facilities are operational and several more are under construction in the United States, and the U.S. proton therapy market is expected to expand in the future. Sumitomo Heavy Industries, Ltd. is a technology-oriented Japanese manufacturer of medical and industrial machinery. Its accelerator technology is widely used in the semiconductor industry and in the nuclear physics research sector as well as in medical applications. FY2012 annual sales is $6.2 billion and the consolidate number of employees is approximately 18,000 worldwide. It belongs to Sumitomo Business Group.